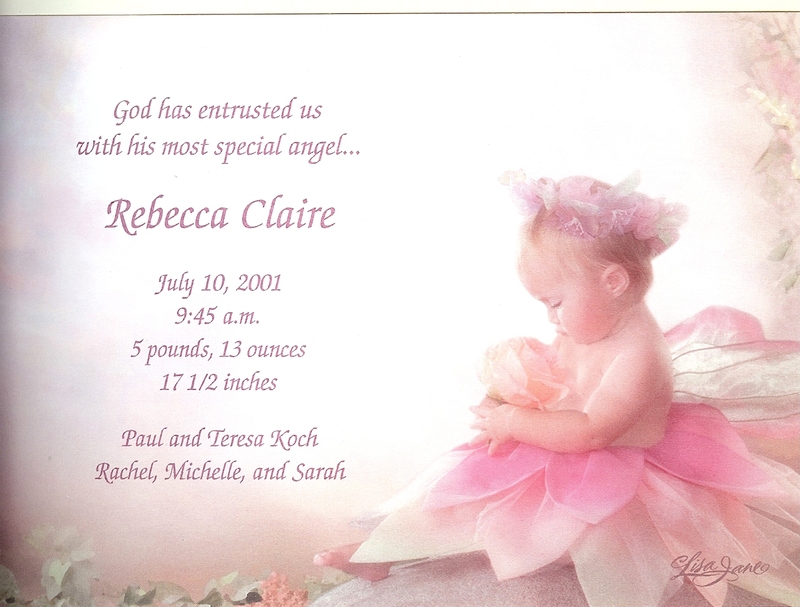 On July 10, 2001, we welcomed Rebecca Claire into the world. She was absolutely perfect – another beautiful daughter. A few hours after her birth, our pediatrician gently informed us that Rebecca had been born with Down syndrome. The next 48 hours were a real emotional roller coaster. We cried, we asked ourselves, “Why?”, and we prayed. A lot. While we mourned the loss of the child that we had been expecting, we very quickly came to realize that we had been given an incredible gift. Rebecca is remarkably healthy. She appears to have none of the major medical problems associated with Down syndrome. Her heart, respiratory, and digestive systems all appear to be normal, she has good muscle tone, and she can see and hear. We won’t know about developmental delays until later, but we are learning that we have to take things one day at a time. Rebecca is the sweetest baby, and she already has everyone in our family wrapped tightly around her little finger. Many of you have asked how we are doing and I can honestly say that we are going to be fine. We said from the beginning of this pregnancy that this child was meant to be. We simply asked that she would be healthy and happy and God answered those prayers. We are now stepping out on a journey of faith and we have to believe that we will be given the strength that we need for whatever may happen along the way. We have been given a very special gift and God trusts us with that gift. It is a humbling thought and an awesome responsibility, but with His help we know that everything will be all right. Sixteen years ago today, we thought that we would never laugh or smile again. How very wrong we were. 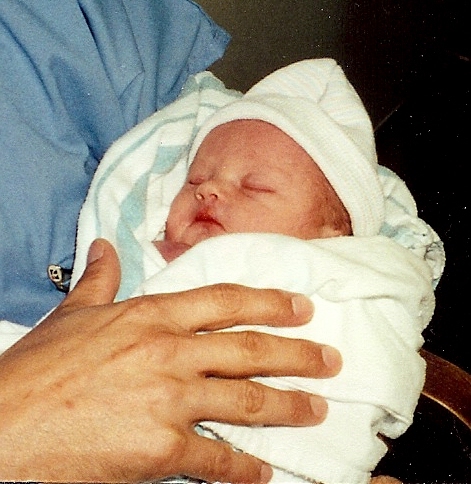 Sixteen years ago today, we thought that God had made a mistake and given this precious little girl to the wrong family. If God ever figures out that he really DID make a mistake, he’s not getting her back. Sixteen years ago today, we thought that life as we knew it was over. And in a way, that was true – our lives have never been the same. We are the richer because of a sweet little angel who was sent down from Heaven to brighten the lives of everyone around her. 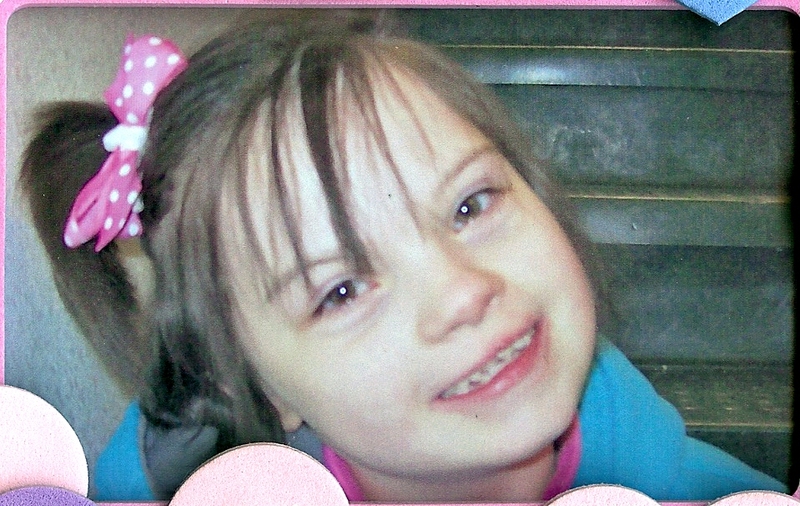 This entry was posted in Family, Special Occasions and tagged Down syndrome, Happy Birthday, Rebecca. Bookmark the permalink. What a beautiful story….tears…..so happy for Rebecca who I had the pleasure of meeting….such a sweet girl and she danced the night away and was so happy at Rachel and Matthew’s wedding…so happy she is in our family. Happy Birthday Rebecca!! and many more! I have a friend who has a child with downs and that lil girl is in her late 30s now, living on her own in an apartment complex where everyone there has downs, they all have jobs and are treated like the normal people they are. She absolutely loves living there, I believe it’s in Florida and the only problem she had was when she first moved in, when her Mom would come and visit, she was so scared that her Mom was going to make her come back home! So, after a few visits when her mom called to tell her she was coming, she always had to tell her, “I’m just coming to see you and not going to make you come home!” Even though it did break her Moms heart that her baby girl was in a different state, she knew that her daughters happiness had to come first! I wish everyone could have the sweet precious personalities of these kids, they are the sweetest, kindest people on earth and I’ve never met a child with downs that ever had a mean bone in their body! I believe God only gives children like this to VERY special people! I don’t know her personally, but, I HOPE YOU HAVE A BEAUTIFUL BIRTHDAY THAT’S AS BEAUTIFUL AS YOU ARE!!! HAPPY HAPPY BIRTHDAY TO YOU & MAY YOU HAVE 100 MORE AND BE TREATED LIKE THE LIL PRINCESS I’M SURE YOU ARE!!!! She is wonderful. Hope that she is enjoying camp.